A high court ruling on the country’s electoral system has thrown Mongolia into political turmoil. On June 29, 2016, Mongolians will be voting for a new parliament, the State Great Khural, for the seventh time since the country’s democratic revolution in 1990. In its 2016 assessment of political transformation towards democracy, the Bertelsmann Stiftung’s Transformation Index (BTI) ranked Mongolia 30th among 129 developing and transition countries. This is significantly ahead of other nations in post-Soviet Eurasia and a great improvement from the country’s 41st rank in 2010. The BTI summarizes Mongolia as a “defective democracy,” though approaching “democracy in consolidation.” Thus, the institutional trappings of democracy are well entrenched in the country. One aspect that remains in flux, however, is the electoral system. The 2012 parliamentary election was contested with a mix of proportional and majoritarian representation and parliament sat on the basis of that election. Yet, on April 21, 2016, Mongolia’s high court rejected the use of party lists to determine the 28-seat portion of parliament to be elected by proportional representation. While this has not declared the 2012-16 parliament to be illegitimate, it has thrown the coming election into turmoil. The argument that has been made against proportional representation is that voters do not elect their representatives as they have no influence over the party lists that are used in assigning seats. Since voters in many countries that use party lists for proportional representation do not seem to feel disenfranchised en masse, this appears to be a very literal interpretation of Mongolia’s constitution. But given the constitutional nature of the dispute, parliament is unlikely to override the high court decision through legislation. It appears more likely that the General Election Commission will revert to the electoral system used last in 2008, i.e. the unusual plurality-at-large or block vote. Under this system, the 21 provincial ridings and the six ridings of the capital are assigned from two to four seats each by population. Voters within these ridings cast as many votes as there are seats in their riding. In the end, this system will elect 76 members as it has in the past. The other likely alternative to a reversion to the 2008 electoral system could be a postponing of the election. This has long been under consideration given that Mongolia is hosting the Asia-Europe Meeting in mid-July 2016, an occasion for many heads of state and government to arrive in Ulaanbaatar from all over Europe and Asia. Choices between these likely options will be made outside of rules explicitly envisioned by the constitution and elections laws. On the one hand the electoral system has been declared unconstitutional, on the other hand legal deadlines pertaining to the election have passed and there is no time realistically to revamp the election system. But, somewhat disconcertingly, there have also been voices that are calling for disregard for the high court decision. 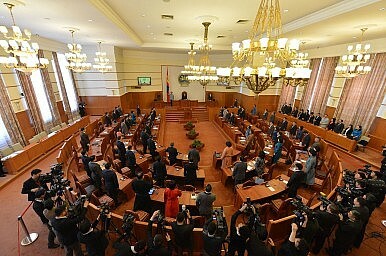 While the court’s ruling was puzzling given that the current parliament was constituted partly through proportional representation four years ago, and many Mongolians see this very much as a political decision, blatant disregard of a high court ruling regarding something as fundamental as the electoral system would seem to be a very dangerous step. It would establish a precedent of a matter pertaining to one of the fundamental institutions of democratic parliamentary elections, addressed outside of the constitutional framework. The turmoil surrounding the electoral system comes amid growing worries about the instrumentalization of law enforcement agencies by those in power. The Democratic Party (DP) had emerged from the 2012 election with anti-corruption rhetoric as an important element in their campaign. Yet, over the past four years, anti-corruption enforcement seems to have focused exclusively on personal and party opponents of certain DP officials and many describe an increasing sense of arbitrary persecution by authorities. At the same time, corruption does not seem to have been curbed in any significant way. Again, the bigger concern here is about an abuse of power and of elements of the justice system, for political purposes. It is unclear whether the challenges to the electoral system will have a significant impact on the outcome of the parliamentary election, whenever it is held. Presumably, any kind of majoritarian electoral system will benefit incumbents and personally prominent candidates, but whether these benefits will accrue disproportionately to any of the parties contesting the election is not obvious. Overall, it is hard to look at the past four years of DP-led governments and think of this period as very successful for Mongolia. Thus it seems most likely that the Mongolian People’s Party (MPP) will win the election though recent polling suggests that the MPP may not be gaining as many votes as one might guess. The likely election victory thus seems more probably as a plurality rather than a majority. Since that suggests a coalition government, the plausible partner for the MPP would be the Mongolian People’s Revolutionary Party (MPRP). This constellation seems even more likely as the two parties were negotiating a formal electoral alliance prior to the deadline for the registration of coalitions on April 29, though finally decided against it. The challenges above present some clear worries about the ongoing political transformation of Mongolia. Yet, 25 years of electoral democracy is a significant legacy. It has to be hoped that Mongolians will make their voices heard about and through the electoral system to emerge from the current crisis with a reinforced dedication to democracy.